Compliance with sharī‘ah - rules is compulsory for all Islamic banks; and such compliance is monitored by sharī‘ah scholars. Therefore, the paper examines and gauges the level of understanding of Nigerian sharī‘ah scholars (the custodians of sharī‘ah rules in the country) and their perceptions of the Islamic banking and its rules particularly interest (ribā). Survey method involving the use of purposive sampling was adopted to administer 1,040 copies of a questionnaire on the Nigerian Sharī‘ah scholars though some key people were also interviewed. The questionnaire which contains 19 items was designed to elicit information from them on issues such as their understanding of ribā, its uses in the Qur’an, Islamic banking products, collateral security and promotion (promos). Our findings revealed that the respondents (917) who considered usury to be forbidden were more than those who considered (871) interest to be forbidden. A large number of Sharī‘ah scholars (93.6%) confused interest with usury which suggests that both interest and usury refer to ribā. Some believed that only usury refers to ribā (48.6%) while most of the respondents (74.1%) opined that all forms of interest are prohibited. About 73.7%, 86.3% and 27.6% of the respondents believed rahn (collateral security), innovating interest-free financial products and patronising conventional banks respectively were allowed. banking and finance. Şeriat İslami bankaların uymak zorunda olduğu kurallar bütünüdür ve İslam alimleri bu bankaların şeriata uygunluğunu denetlerler. Bu makale Nijerya’daki İslam alimlerinin İslami bankacılık ve özellikle riba gibi onun kuralları hakkındaki anlayışını ve görüşlerini incelemektedir. Seçici örneklemle 1400 adetlik anket formları Nijerya’daki İslam alimlerine dağıtılmıştır. Ayrıca, bazı anahtar şahsiyetlerle de yüzyüze görüşmeyle anket yapılmıştır. Anket sorularında 19 kısım bulunmaktadır ve İslam alimlerinin riba, Kur’an’daki ribanın kullanımları, İslami bankacılık ürünleri, teminatlar ve teşvikler konularındaki görüşlerini tespit etmek için oluşturulmuştur. Elde edilen bulgulara göre tefeci faizinin yasaklandığını düşünenler (917) faizin yasaklandığını düşünenlerden (871) daha fazladır. İslam alimlerinin % 93.6’sı tefeci faizi ile faizin riba’yla aynı olduğunu ifade edecek şekilde cevap vermişlerdir. Cevap verenlerin çoğu (%74.1) faizin bütün çeşitlerinin yasaklandığını ifade ederken bazıları (%48,6)’sadece tefecilik faizinin riba olduğunu söylemiştir. İslam alimleri sırasıyla, %73,7, %86.3, ve %27,6 oranlarda teminatların, faizsiz finasal ürünler geliştirmenin, ve konvansiyonel bankaların müşterisi olmanın müsaade edildiğini düşünmektedirler. Abdul-Wahab, T.A. (2006). Application of Sharī‘ah in Southern Nigeria: The Hoax the truth.Shaki.Al Furqan Publishers. Bashar, M.L. A. (19990. “ Some Conceptual Issues in Islamic Banking”. A paper presented at a workshop on Non-Interest Bankig. Organised by Habib Nigeria Bank Limited Training Centre, Kaduna, 9-10 April. Bashir, A. U. (2010). “The Impact of Interest Free Banking on the Nigerian Economy”. A seminar on Non-Interest Banking organised by the Nigerian Deposit Insurance Corporation (NDIC), held at the Transcorp Hilton Hotel, Abuja on November 24. Bawa, M.A. (1993). “Proposal for Establishing Islamic Banks in Nigeria” in Gusau, S,A. AND Bashar, M.L. (eds.). Readings in Islamic Economics. Vol.2. Department of Economics, Usman Danfodiyo University, Sokoto. BOFIA, (1991), Banks and Other Financial Institutions (BOFIA) Decree 1991. Lagos, 20th day of June 1991. Byson, B.M. (2015).” Is time ripe to adopt Islamic Financial Systems in Secular Developing Countries? A Review of Literature”. Management and BusinessResearch Economics and Commerce Vol.15.Issue 8. Doi, A.I. (1984). Sharī‘ah (The Islamic Law). London: Ta Ha Publishers. Fakhrul-Ahsan, A. S. M. (1998). Islamic banking in perspective: Concepts and Practices. Kano: Tofa Commercial Press Ltd.
Kareem, M.K. (2011) Advanced Study of Muslim Law. Ibadan: Distance Learning Centre University of Ibadan. Muazzan A. and Sauda A (1996). Journey Towards Islamic Banking. London: UK. Institute of Islamic Banking and Insurance .1996 2-7. Khan, M.M. (nd)Sahih al-Bukhari Arabic-English. Volume III. Beirut: Dar al-Arabia. Nnamdi, A. (2004). Research Methodology in the Behavioural Sciences. Lagos: Longman Nigeria Plc. Onwughalu, T. (2011, July 17). “Okogie condemns Islamic banking”. Daily Sun, p.13. Quadr, Y. A. (2000). Shari‘ah : The Islamic Way of Life. Ijebu-Ode: Shebiotimo Publications. Saeed, A. (1996). "Islamic Banking and Interest: A Study of the Prohibition of Riba and its Contemporary Interpretation". Leiden, Netherlands: E.J.Brill. Sanusi, L. S. (2011).”Islamic Finance in Nigeria: Issues and Challenges” Lecture Delivered at Markfield Isntitute of Higher Education (MIHE), Leicester, UK, 17 June, 2011. Usman, S. (2003). The Legal and Regulatory Issues of Islamic Banking in Nigeria. In: Sulaiman, S. and Galadanci, B. (eds. ), Islamic Banking: General Framework and Case Studies. Kano: International Institute of Islamic Thought (IIIT). Yekini O. L. (2012). “Islamic Banking in Nigeria: A Stimulant for Mobilising Funds for Productive Activities”. American Journal of Social and Management Sciences. ISNAD KAREEM, Muritala Kewuyemi . "ISLAMIC BANKING AND SHARĪ‘AH SCHOLARS IN NIGERIA". 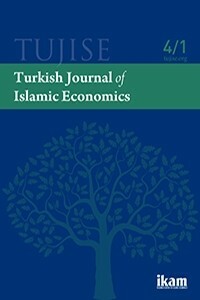 Turkish Journal of Islamic Economics 4 / 1 (February 2017): 85-112.